Customers are letting us know how much they enjoy our stainless steel threaded Leveling Mount, 1210120-AB20-SS. With its heavy duty, high load capacity and black acetal base its a customer home run! 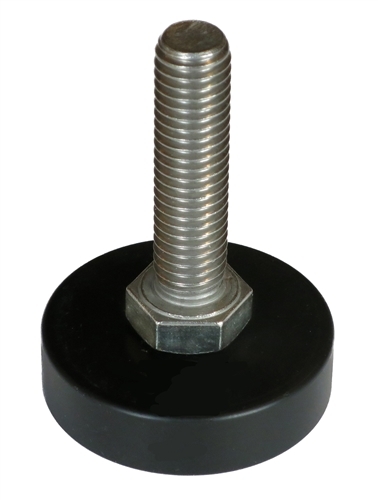 We have received many reviews of these Leveling feet in the past year about their great durability and low cost. Don from New York wrote, "I bought these for a table saw since the original legs were no longer available. On advice from Lakeside Industries I chose the fixed base and carefully matched the measurements to the original. These legs are of much higher quality than the original and have met my needs beyond expectations. Lakeside Industries was very easy to work with and shipped my order quickly. I would highly recommend this company based on my experience." Mark from California wrote, "Yes, they are very nice and they fill an empty niche. Most leveling feet fall in either of 2 categories; furniture grade junk or industrial 5,000+ pound rated uber expensive. For us in the aquarium hobby, with tanks that weigh 1000-5000 pounds, there is not a whole lot available. Your feet were reasonably priced, had protective and swivel base option and are stainless steel corrosion resistant. You really hit a home run for us :) "
Lakeside Industries is pleased to announce the launch our newly redesigned website, www.lakesideindustries.net . We have redesigned our site as we insist on maintaining the highest standards for your buying experience.